Review: Let me just say, I read the newest book first, No Ghouls Allowed, and had never read any of the books in this series. Although I thought it wasn't hard to follow, I do believe that reading the newest one first was a blessing. No Ghouls Allowed takes us to M.J.'s beginning, literally. I'm glad that this is the way things turned out because now I have all the other books to look forward to reading! This story is about M.J. Holliday, a psychic medium, with a huge heart and a need to help lost spirits move on to the light, or dark, whichever the case may be. M.J. started out doing readings but got burned out, and switched to ghost busting. 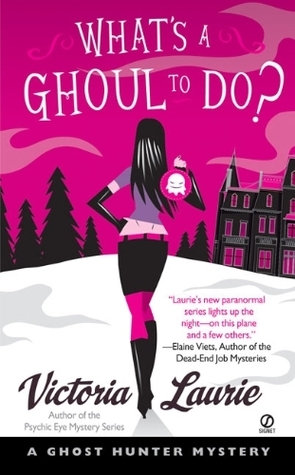 Her best friend since the first grade, Gilley Gillespie, has been by her side through thick and thin and has ventured into the paranormal world with M.J. as a partner in the ghost busting business. M.J., being a descendant of the infamous Doc Holliday, has chosen to name her African Gray Parrot after him, and I mention Doc because he plays a supporting role within the story. The story takes place in Boston, where M.J. is sought after by a gorgeous surgeon, by the name Dr. Steven Sable II, to investigate the lodge where his grandfather committed suicide. Steven doesn't believe his grandfather would do such a thing, knowing how happy his grandfather was, and suspects foul play. Their have been unexplained phenomena taking place in the lodge since his passing which brought forth the idea that Andrew, Steven's grandfather, was haunting the place. After much reluctance, M.J. agrees to take the case and packs her bags to go up north a few hours to where the lodge is located. Then there is the meeting with this new potential client M.J. has to get home to quick-like. She arrives in time but not before having to drive behind a dude going really slow and on his phone. Gilley and Doc are carrying on as soon as she walks in, and then the client arrives. He's a to-die-for, yummy doctor who is stupid rich, and he wants M.J. to do a job for him! But Dr. Delicious (the name Gilley used to refer to the client, which Doc quickly picked up on and yelled out at inappropriate times) wanted to be part of them team during the investigation, which is M.J.'s No-No Rule #1. He walks out, not accepting those terms and taking his business with her. Now, she has to get ready for a blind date that Mama Dell, from Mama Dell's Coffee Shop, set up for her. The characters were such a good fit together and had me laughing out loud throughout the book. Mama Dell was a southern belle who lived in Boston for 30 years with her husband. She opened up a coffee shop not knowing a damn thing about coffee and made the worst coffee ever, which made her an inside joke to the locals, but also made the shop very popular. One thing Mama Dell was good at was matchmaking. She even had profiles for people to fill out, LOL! Gilley was as gay as gay could be, and he didn't care who knew it! He has a very no nonsense, take no crap personality, but he also is very quick with the sarcasm and jokes. M.J. is a workaholic with no time for a dating life. I'm not sure if this attitude was drawn from her mother dying at such a young age or from the fact that she hasn't met the right guy yet- one that takes her abilities seriously. So M.J. going on this blind date that Mama Dell set up for her was a big deal. Then there's Teeko, aka Karen O'Neal, M.J.'s best friend. Teeko is a knockout, hence the name Teeko which came from TKO (total knock out). She didn't play much of a role in the book, but when she did, it was always in the coffee shop, talking about men. After listening to a lecture from Gilley about business and her unwillingness to grow and change, M.J. arrives to the conclusion that he is right and accepts the job from Dr. Delicious, THANK GOD! Dr. Steven Sable II is a hunk of burning love from Argentina. He went to private schools in Germany, speaks five languages, and did I mention he was very lick-able?? English is a work in progress for him, which gives him charm and personality. Misuse of the language had me rolling with laughter and thanking the stars this book series was brought to my attention. I loved every part of this book, funny, scary and sad. It was a well-written story with super awesome characters who gave M.J.'s world the perfect balance.